Welcome To Ladun Liadi's Blog: LA Council To Rename Crenshaw & Slauson Intersection "Nipsey Hussle Square"
LA Council To Rename Crenshaw & Slauson Intersection "Nipsey Hussle Square"
The Los Angeles City Council is expected to change the name of a South L.A. intersection on Friday to honor late rapper Nipsey Hussle. Councilman Marqueece Harris-Dawson said he will officially submit a motion on Friday to rename the intersection of Crenshaw Boulevard and Slauson Avenue to "Nipsey Hussle Square." Nipsey Hussle, whose real name is Ermias Asghedom, had a song called "Crenshaw and Slauson (True Story)". A nearly 12-minute documentary-style music video for the song features real people from the Crenshaw neighborhood, where Nipsey Hussle grew up. His store, Marathon Clothing, is also located at this intersection. The Grammy-nominated rapper was shot, along with two other people, while standing outside of his store. Fans advocated for the intersection's name change and started a Change.org petition to urge the city council to submit the motion. 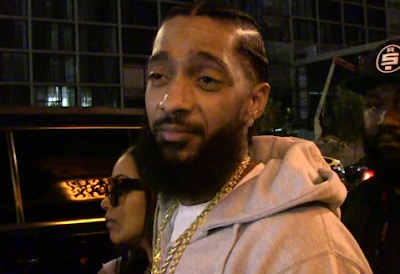 "Please call or email Councilman Harris-Dawson to let him know you support this effort," wrote the petition's creator, Najee Ali, who said he personally knew Nipsey Hussle. "He wasn't just a rapper. He was a community icon," Ali said. The petition has nearly reached its goal of 500,000 signatures, and clearly got the councilman's attention. After Harris-Dawson tweeted his plans to propose the name change, L.A. City Council President Herb Wesson tweeted his approval. "[Nipsy Hussle] created a legacy that will last long after his life on earth. Thanks to the leadership of [Harris-Dawson], Angelenos will remember the impact he made on so many whenever they drive through the intersection of Crenshaw and Slauson," Wesson wrote. Nipsey Hussle was a local activist who impacted the community and had plans to work with the police department to discuss ways of fighting gang violence. After his death on March 31, the Crenshaw community created memorials for the 33-year-old father across the city.